What Is the TI-84 Plus CE? The TI-84 CE Plus is the latest in a long line of TI-84 calculators, but with a better color screen, battery life, software, and a more compact size. It is the most widely adopted, widely trusted calculator by teachers in American classrooms. In this TI-84 Plus CE Review, I’ll explain why it made my list of the best graphing calculators for students. The new TI-84 Plus CE is thinner, lighter, and comes in a rainbow of colors. Click here to see the TI-84 Plus CE price Amazon. The most popular graphing calculator model line ever, the TI-84 Plus, has continued to evolve into the late 2010’s. Released in 2015, barely one year after the TI-84 Plus C brought color to the 84 family, Texas Instruments rebooted the color line with the TI-84 Plus CE. The 84 CE is new hardware with a new look, but with much in common with its predecessor. So how does this new model stack up? It has been on my list of the best graphing calculators every year since it was released. What’s the Same About the TI-84 Plus CE? Actually, a lot has stayed the same between the TI-84 Plus CE and older 84 models, specifically the 84 C. That’s a good thing if you have owned an older TI-84 or need to get help from a tutor, sibling, or teacher that is used to working with the TI-84 family. They will be able to jump right in on this model with no problems. The arrangement of physical buttons is the same, the menu system is virtually identical, and the you get the same great color screen that the TI-84 Plus C had. Truthfully, a big selling point for the TI-84 Plus CE is for long-time users to pick up a familiar calculator and jump right in with a familiar interface, but getting to do so with hardware that will take us to 2020 and beyond. What’s Different About the TI-84 Plus CE? The biggest change you’re going to notice with this model is the size. Officially, Texas Instruments says it is 30% lighter and slimmer than previous generations of the TI-84 Plus. However, I can tell you that the difference when you hold it in your hand feels even more significant. I’ve been calling it the “TI-84 Air.” The CE is the right size and weight to stuff into a book bag or purse without feeling like you are being burdened down by it. I’m a long time user of the TI-Nspire family as well, and it felt to me like the TI-84 Plus CE was even lighter than my TI-Nspire CX. To be sure, I threw it on my kitchen scale. Sure enough, it weighed in at 7.0 oz. My TI-Nspire CX was 10.0 oz. While the physical location of buttons is identical to that of older TI-84 models, the buttons themselves are smaller and rectangles, rather than rounded. This looks more like the TI-Nspire buttons and gives the CE buttons a modern look. The CE has its own new operating system. While it is nearly identical to previous TI-84 models, an important difference is that you can’t transfer apps from older models to a CE. To remedy this, Texas Instruments has issued new versions of all its most popular apps via their website. In fact, my CE review unit shipped with many popular apps like Finance, Conics, PlySmlt2, and Transfrm. In addition, Texas Instruments has continued to create new versions of virtually all the popular TI-84 apps such as Probability Simulation, Cabri Jr, and the Periodic Table app. TI has actually added the ability to do an upgrade “bundle” by getting the latest version of the OS and all the latest apps at one time. When I originally compared the previous generation TI-84 Plus C (a bulkier version of the CE) to the TI-84 Plus CE, I was hard pressed to find many changes in the user interface. I explored various menus, apps, etc. and noticed only a few extremely minor differences. For example, when exploring the “MODE” menu, a couple of options had changed. Here you can select what language localization you want if you are not a native English speaker, as opposed to going through apps, which is how it is done on older TI models. Additionally, while the 84 Plus C gives 3 options for the format of answers: “AUTO”, “DEC” (decimal), and “FRAC-APPROX”, the last option is eliminated for the CE. I’m not sure what the rationale is here, but it means you cannot select a mode that automatically converts all answer from decimals back to fractions with the CE. Additionally, there are a few visual tweaks with the already awesome PlySmlt2 app that I like. Rather than enter coefficients in a matrix for a system or list below the equation for a polynomial, the app now allows students to enter the coefficients right next to the variables. I think this will really help them understand what the app is doing. PlySmlt2 has always been one of my favorite apps for the TI-84 family, and this is a small but thoughtful touch that shows TI is still thinking about how students use these apps. The biggest thing to know about the TI-84 Plus CE OS is that Texas Instruments has continued to support it after the calculator was released. There have been additional operating system updates, and the latest as of this review was OS 5.3, which came out in the Fall of 2017. These continued updates can give you confidence that it will be supported throughout a high school or college career. TI always patches bug fixes when they do these updates, but I’m more interested to see if they add additional features for the students, and they have. The most interesting feature to me for OS 5.3 was an improved system of graphing piecewise functions, incredibly useful for students in Pre-Calculus and Calculus. While the TI-84 Plus line has always been able to graph piecewise functions, the interface for doing so was clunky. Now, to graph piecewise functions, just select piecewise( from the MATH menu while graphing. You select the number of pieces in your function, and voila, you will see a piecewise function template to fill in that looks just like what you’d see in a textbook. The TI-84 Plus CE has a “deep sleep” mode that allows it to hibernate while preserving battery if it’s not used for several days at a time. With regular use, it can run a month on a single charge, but in deep sleep mode, it can maintain nearly a full charge over summer break. From personal experience, the CE battery really can hit these numbers. Additionally, Texas Instruments took a page out of another update they recently made to the TI-Nspire line of calculators. Older TI-Nspire CX calculators and the TI-84 Plus C all had batteries that had a wired connection. The new Nspire CX and the TI-84 Plus CE does not use this wiring, but instead just uses the sort of contacts you’d find in a cell phone with a removable battery. As a person who has had to remove the battery from literally hundreds of student Nspire CX’s, let me tell you that TI-84 Plus CE users will appreciate this new battery design if they ever find they need to replace their battery. Replacing the old wired battery was a bit harrowing for the uninitiated, as it often felt like you might damage the calculator or battery during the replacement process. 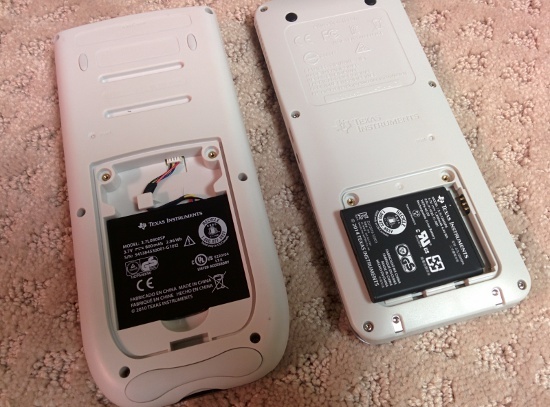 The new TI-84 Plus CE (right) battery lasts longer and is easier to change if it ever wears out. 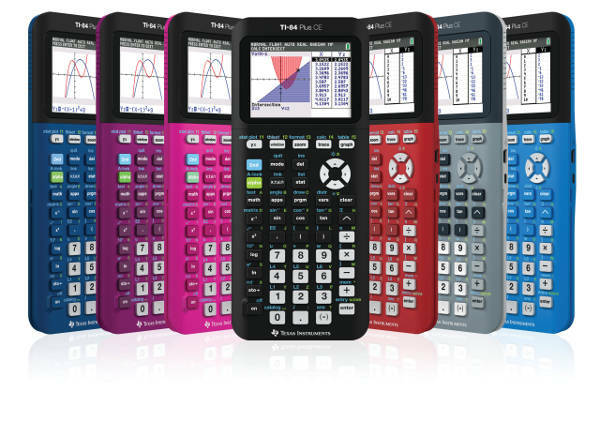 Texas Instruments has definitely picked up on the fact that color sells and the TI-84 Plus CE can be purchased in a variety of colors like red , pink, plum, black, gray, and 2 shades of blue. The preview model Texas Instruments provided me with is gray, which looks a lot like the older TI-84 Plus Silver Edition. Both of the blue models look particularly enticing to me, but I can see the appeal to any one of these models. Don’t be surprised if some of these colors are in short supply if you look for yours during back to school shopping season. What’s the Difference Between the TI-84 Plus and the TI-84 Plus CE? Weight 7 oz. 10 oz. Already we have seen features added to the TI-84 Plus CE that the TI-84 Plus will probably never get such as the ability to graph on pictures, interface with the TI-Rover, improved piecewise function, etc. That trend is likely to continue as long as the TI-84 Plus CE is the flagship of this line. Is the TI-84 Plus CE allowed on the ACT / SAT? Being able to use your graphing calculator on the most important tests is crucial. If you are buying a TI-84 Plus CE with the high school standardized tests in mind, you will be OK on all the major tests. Is the TI-84 Plus CE Worth the Money? The TI-84 Plus CE is a seriously impressive calculator. It takes all of the things that made earlier TI-84 models great and improves on them: better screen, slimmer design, longer battery life, while maintaining what made previous models great. It’s still the most widely used, widely accepted graphing calculator in classrooms today, which means it’s likely that your teacher or professor will be able to use it right along side you. If you can afford it, pick up a TI-84 Plus CE on Amazon and don’t look back. It’s the best TI-84 yet in a family of calculators that has been loved and used students and teachers alike for many years, and this model is worth the extra few bucks. If you really can’t afford this better model, an alternative is picking a used TI-84 Plus on eBay (they don’t have the latest features but are built like tanks and last a really long time).